This mouthwatering blueberry crisp is the perfect summer dessert, and it makes going out blueberry picking for the freshest berries totally worth it. Making a crisp is even easier than baking a pie as you don't have to roll out the dough. The spiced crisp topping is made with a combination of oats, brown sugar, butter, and cinnamon. Instant tapioca is the thickener for the blueberry filling. If your berries are on the tart side, add an extra tablespoon or two of sugar to the filling. While making a blueberry crisp is a great use of fresh blueberries, you can also use frozen blueberries. Just be sure to let them defrost before adding them to the filling. This recipe is easily modified for any type of berries, so don't be afraid to use it during raspberry, blackberry, or boysenberry season. You can also use a mix of berries for a triple berry crisp—great when you've got a smaller amount of each available. Butter a shallow 2-quart casserole dish. In a large bowl, combine the blueberries, granulated sugar, instant tapioca, and lemon juice. Mix gently to combine thoroughly. Transfer the mixture to the prepared casserole dish and let it stand for at least 15 minutes. This gives the tapioca time to soften. In another bowl combine the oats, flour, cinnamon, salt, melted butter, and brown sugar; stir to blend. Spoon the topping mixture over the top of the berries; spread gently, covering completely. Bake the blueberry crisp in the preheated oven for 45 minutes. 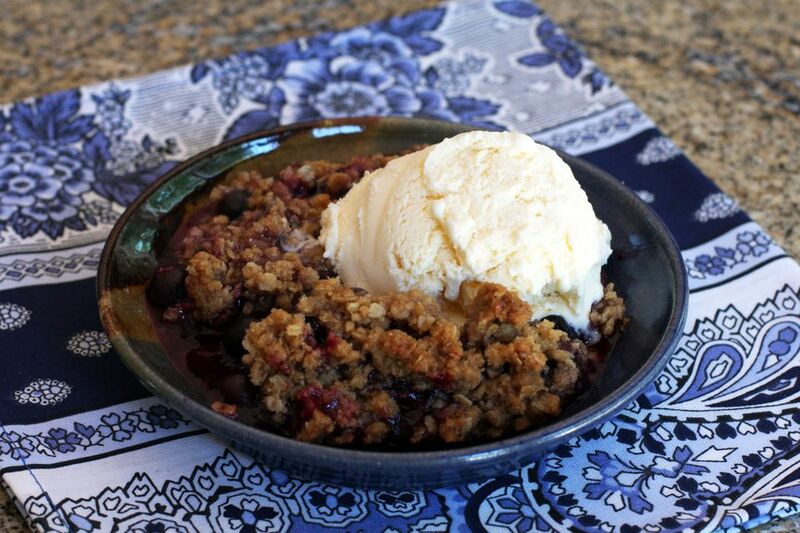 Blueberry crisp is delicious to enjoy while still warm with a scoop of vanilla ice cream or a dollop of whipped cream. Cover and refrigerate any uneaten portions after the crisp has cooled. Any leftovers are also delicious for breakfast, either reheated in the microwave or cold. For a gluten-free version, use a gluten-free baking mix in place of the flour and make sure the oats are gluten-free. If you are cooking for those who must avoid gluten (or taking it to a potluck where someone is sure to request gluten-free items), you will get just as good of a result. While instant tapioca thickens nicely, an equal amount of arrowroot starch will give the same results. If you don't have either, use an equal amount of cornstarch or flour. Add 1/2 cup of chopped pecans or walnuts to the oat topping.